Continuing our countdown of the top anti-THR liars of 2013, we have a last-minute entrant, Cheryl Healton, who seems to be the perfect representative of the stone age (i.e., c.2003) faction of the tobacco control industry. Even as the post-Healton leadership of the American Legacy Foundation seems to be moving toward realizing the value of THR (though they continue Healton’s tradition of just hoarding the Foundation’s money, not actually doing much other than paying extravagant salaries), she writes anti-THR lies with the simple-mindedness of a past era. Of course, she is not alone in this, and thus is symbolic in the #7 spot for thousands of people in local health departments, schools of public health, and the media who also traffic in the simple-minded lies (another recent example). For years the tobacco control industry did not need to say anything other than “we think this is bad” to win over a gullible public. But the public has become much more sophisticated about this topic and about mass communication in general, and of course have betters sources of information than whatever some county health official told the clueless local newspaper. The better liars have learned how to deploy sciencey lies rather than just assertions and innuendo, which is more effective at tricking people, and also at not making the speaker look like an idiot. But there is still a large paleo contingent — a far larger headcount than those who have gotten more sophisticated — who are not really part of the debate and thus have never been schooled that they cannot just lie like it is 1999, a time when there was little organized opposition to their lies. My favorite example in this case is Healton, in urging New York City to ban the use of e-cigarettes anywhere that smoking is banned (see above link), deployed the paleo-tobacco-control tactic of calling for extreme restrictions on freedom — and the resulting damage to public health — in order to solve a simple problem. Perhaps she is right that not allowing vaping on packed subway trains is reasonable, but what, exactly, does this have to do with not allowing bars to choose for themselves whether to allow vaping and how does it justify banning it throughout Central Park. The one other specific place she cited, in terms of suggesting that upstanding citizens like herself should oppose e-cigarette use there, was walking down the street. Of course, this is about the only place left where people can vape (or smoke) given the restrictions. 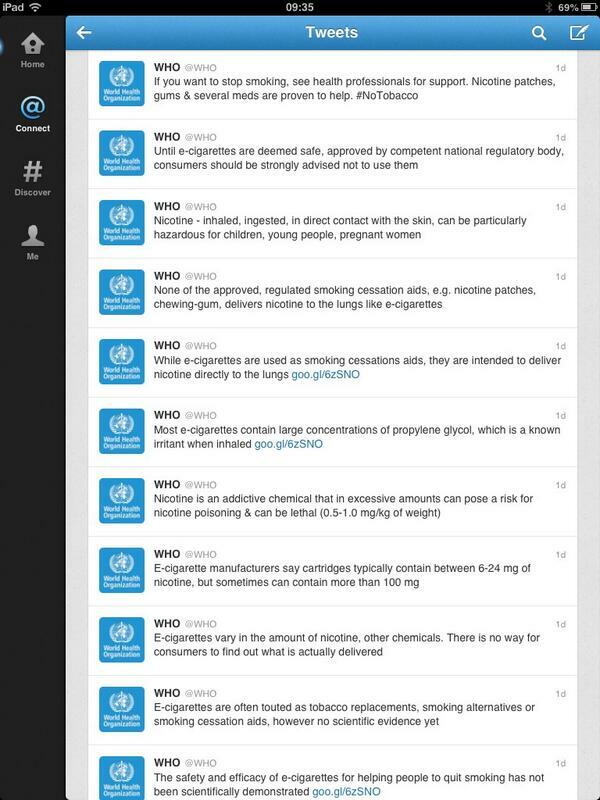 That is just classic tobacco control: imposing restrictions that do not even address their own stated goals. An important distinction needs to be drawn between Healton (and others like her who are getting rich off of anti-THR) and the workaday health department bureaucrats and clinicians who act as the footsoldiers for paleo tobacco control. The latter are merely useful idiots who Healton and company manipulate. They tend to be non-specialists and do not even pretend to be scientists, and are victims of the lies that are crafted by the actively dishonest puppet masters. The knowing liars are clearly the most guilty. Still, this does not let the ignorant liars off the hook — they may not pretend to be scientists but they do pretend to be experts on the topic when talking to the press, the public, politicians, or clinical patients. They repeat the lies that they have been told as if they have assessed them to be true, when really they have no clue about the truth — and know it — and are merely transcribing what they have been told. People living in the information age have no excuse for allowing themselves to be brainwashed by widely-debunked lies. 2014 might be the year that determines whether tobacco harm reduction (THR) will sweep the world (at least the wealthy parts of it) by 2025, or whether its delay, and the resulting suffering and death, will drag out for another decade after that. That made 2013 an interesting year for those of us who monitor the extremists who are actively working in support of the suffering. After we decided we should do a year-end countdown for 2013, it quickly became apparent that this does not lend itself to just listing particular individuals. The lying is really not about particular personalities, though we do mention a few who stand out (not in a good way). Thus, the list is a hybrid of people, types of liars, and types of lies, with the named entities mostly serving as symbolic representations. It also became apparent that it was not all that useful to just base this on some rough counting of the lies, how blatant they were, and how loud they were shouted. Rather, this is a gut-level hybrid that considers that, but also how much the lies and the liar matter and other considerations. So you will see that the entity whose actions matter the most on this list is at #3, while the most blatant and aggressive liar is #8. Also, rather than forcing the count to match the number of fingers humans happened to evolve, we identified those worth mentioning and went with that count. Thus, we start with #8: Stanton Glantz (from the archives) and the University of California, San Francisco, whose once good reputation among real scientists has been heavily damaged by Glantz and his anti-tobacco extremist colleagues. Now some might be surprised to see Glantz so low on the list because, as noted, he does earn the special award for Most Aggressive Liar. For the course of a decade of all the anti-smokeless-tobacco lies, he was relatively silent about THR, despite being one of the most toxic anti-smoker activists, in terms of both his lies and general innumeracy and cluelessness about science. But this year he turned his superpowers — an apparent inability to distinguish lies from truth (or the sociopathology to not care about the distinction) and ability to trick people into thinking he understands science at better than a middle-school level — to anti-e-cigarette activism. He ranks low, however, because he is just an accident of history, the person who happened to stumble into the crazy jester niche that someone always fills. For any contentious and important topic, there is room for someone to gain fame and fortune by being the extremist liar, and so someone always fills that niche. For most lie-based activist positions, the Loudest Liar niche tends to be filled by some entertainer or gadfly of letters, or an organization that can attract a few wealthy backers. But when there is government grant money backing the lies, it is often an unscrupulous mediocre professor who fills the niche. Still, Glantz is worth mentioning as more than a generic type because of a few particular propensities. Most notably he excels at relentlessly repeating lies about what research shows, even after being explicitly publicly corrected by the researchers (and anyone else with basic literacy skills who weighs in), who point out that he is completely misrepresenting their results. Those are some serious crazy-liar chops. Few people, even among the other major anti-THR liars, will so baldly misrepresent what the science shows (except when it is the junk science from their tobacco control industry fellows, and thus the authors misrepresent it in the first place). Fewer still are so unconcerned with their reputation that they will keep repeating the lies after being pointedly reprimanded for them (or perhaps they actually have a sense of decency). For that, Glantz rises above (which is to say, sinks below) just being a font of generic lies. He further secures a position on the list, in spite of having descended to jester status — even within the tobacco control community — because he and UCSF won one of FDA’s huge Tobacco Centers of Regulatory Science (TCORS) grants. Frankly, this award says more about the process used to decide these awards. (Aside: it is not just those of us who prefer real science over tobacco control who feel that process was an embarrassing failure. In addition to turning down some excellent applications from politically neutral centers and industry-academic cooperations, they turned down quality applications from established tobacco controllers who are good scientists — and were also livid about this — in favor of the UCSF hacks who apparently do not even know 101-level concepts like the difference between correlation and causation.) Unfortunately, that center grant is going to lend some credibility to the hacks among the ignorant masses even though, among the knowledgeable, it instead serves to damage the credibility of the granting process. The one bright spot about funding in this story is that UCSF sought grassroots crowdsourced donations to support one of their anti-e-cigarette “research” efforts but were offered only a pittance from a few donors in spite of offering incentives. (If you click that link, notice that they already declared what conclusion they would reach in the request for funding, much as they did with the TCORS application — they do not do research, they write political propaganda and do not even try to hide that plan.) Contrast this with CASAA’s research fundraising, in which we secured that sum for the Igor Burstyn research in four days. There simply is no grassroots support for the likes of Glantz and UCSF, and tobacco control in general. There might be millions of people who will express pro-TC and anti-THR opinions in opinion surveys, but their feelings are only a millimeter deep — they would not spend a dollar or a minute of their time supporting that cause. As some of the rest of this countdown will further illustrate, anti-THR exists only because extremists have seized control of some government and other institutions, but that control is eroding as their lies become more widely understood. Nocera…implies that the science related to e-cigarettes is being ignored by the public health community. It is not. But what he then goes on to present is the little corner of the science that supports an anti-ecig position — a corner that is mostly filled with the worst junk in the field. I suppose he might argue what he said is technically right, since the “public health” community merely ignores almost all the science, including in particular the most useful science. Early studies of the value of e-cigarettes as a smoking-cessation device have found that they are no more effective than nicotine replacement therapies approved by the Food and Drug Administration. Here he is employing the standard liar tactic of pretending that some fairly useless research is what we should focus on, rather than the overwhelming evidence from other sources that shows that e-cigarettes work. Moreover he lies about even that: there was only one such study (not plural) and it did show that e-cigarettes did better than the NRT. Of course, they did not do nearly as much better as they do in real life, but that was because the study was pretty much useless: poor-quality e-cigarettes, given to people who do not necessarily want them in an artificial situation are not terribly effective. No expert real scientist puts much stock in that study. The real science can be found in the evidence about how many people have switched, which Shah pretends does not exist. At least he implicitly admits that NRTs are not effective. We also know that the smoke that comes off an e-cigarette is not just “vapor,” a term probably promoted by the industry to make it sound innocuous. The funny thing is that he is technically correct, though he probably is too innumerate to know it: The “vapor” is, of course, mostly aerosol, with very little actual vapor. I cannot fathom what he could possibly mean by the “just”, though — no one claims that because it is vapor (or aerosol) it poses no substantial health risk. That would be stupid. And I mean “public health”-level stupid. There are obviously a lot of vapors and aerosols in the world that are very harmful. Indeed, the word “vapor” has, in the history of public health, generally been associated with source of harm. The real argument is, of course, that we know what the exposure actually is (consumers care about the actual chemicals, unlike “public health” that is satisfied to just assign labels). Based on that we know that the risk is very low. Shah lies by setting up a straw man. There has been an increase in use of e-cigarettes coincident with the aggressive marketing of the product. But there has been no concomitant increase in the incidence of smoking-cessation coincident with the use of e-cigarettes. Much remains unknown. How will smokers and former smokers use e-cigarettes: to reduce tobacco use or to maintain nicotine addiction by smoking e-cigarettes where they would normally have to abstain? Does the doubling of e-cigarette use by youth in the last year portend an increase in tobacco use that will reverse the significant reductions in cigarette use since 2000? The “doubling of use” claim is a well-documented lie, of course. But even if it were not, it obviously would do nothing to cause cigarette use. It would tend to increase the reduction. Of course, pretending not to be lying, Shah did not actually assert the claim that he is carefully implying. He phrased it as a question, a classic liar tactic. Most would agree that there is no public health value in youth nicotine addiction and that regulation by the F.D.A. as a tobacco product is necessary. Wow, you could use that as a dictionary example of “straw man”. The lack of science on critical questions should be cause for close regulation of e-cigarettes until these questions are better answered, rather than careless optimism with the lives of our youth. Oooh, if we do not ban these it will kill the chiiiiildren! Except that they are close to harmless and substitute for far more hazardous behaviors even among chiiiildren. We have enough science to know without a doubt that there is no dire hazard here that calls for precipitous action. Yes, some science would be helpful in making regulations. Isn’t that what the “public health” types always crow about: science-based regulation. So why is it they are always asking for regulation that is explicitly based on a lack of science (or more precisely, in pretending that there is a lack of science)?